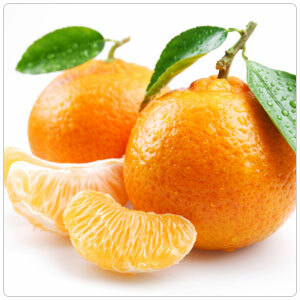 The Fairchild tangerine is a cross between a Clementine mandarin and an Orlando tangelo. The skin is thin with a deep orange color, is somewhat pebbly, and doesn't peel as easily as some other tangerines. It is juicy with a rich and sweet flavor and contains seeds. Fairchild tangerines are sometimes found with the stem and leaves still attached. Mandarins and tangerines have many uses. Freshly squeezed juice can be added to cocktails or mixed with other citrus juice. The segments make great additions to salads and compotes. They also make brilliantly colored marmalades and candied peel. Mandarins were first imported into the Mediterranean region from China through the port of Tangiers; it was at this time that the name Tangerine became associated with Mandarins. The name tangerine has no botanical standing and the term is rarely used outside the US. The use of the word appears to have developed as a marketing term for various varieties of Mandarins, such as Fairchild and Dancy. To put it succinctly, a mandarin is a mandarin and so is a Tangerine. The Chinese believe the stems and leaves attached to the tangerine are a symbol of prosperity and good luck. The Fairchild tangerine is one of California's most heavily planted varieties.